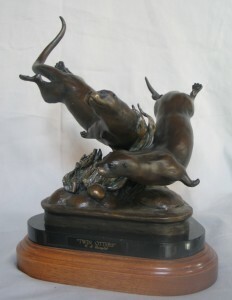 The beaver is the iconic Canadian symbol of industry and ingenuity. 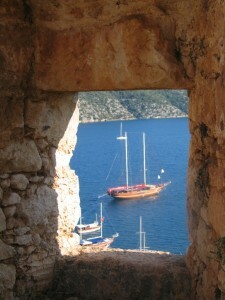 He is uniquely equipped to alter his landscape and survive anywhere there is running water. 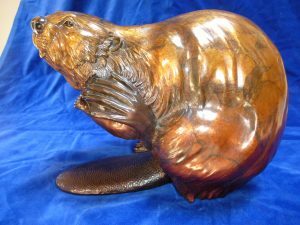 The beaver was instrumental in encouraging explorers in North America to expand the frontier and beaver fur was widely used to create felt hats and warm blankets. The historic importance of this animal is often belied by our often complicated relationship with this tree chewing, dam building, tail slapping rodent. Hail to the beaver! In the mid-coastal rain forest of British Columbia lives one of the most unique and geographically isolated species. The Kermode subspecies of black bear is not an albino, but rather, is a genetically fixed color phase. Being a recessive gene allows offspring of other colors to be born to the same mother. 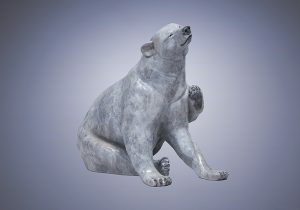 These bears are protected, revered and held in spiritual esteem by those who encounter them. Although known to be unusually friendly, they have only been studied by a fortunate few. This piece is free standing and measures 8 inches tall and 12 inches wide. 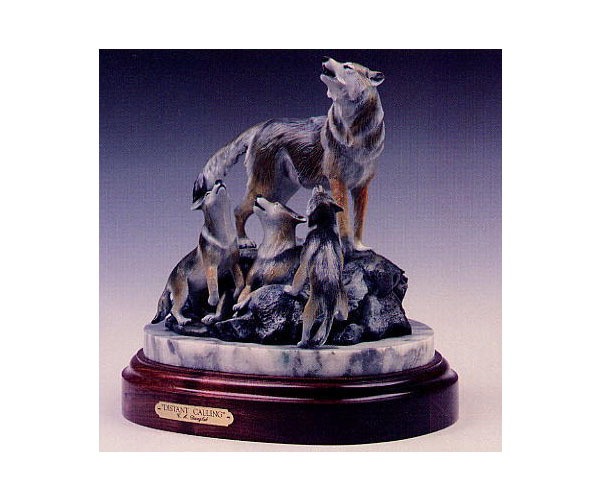 It features an enhanced patina which showcases the animals unusual colouring. The edition in limited to 50. 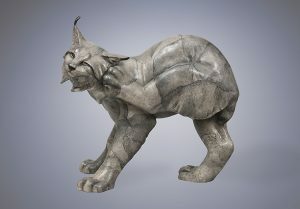 “Lynx” is the first of a new series of free-standing and smooth surfaced bronzes. 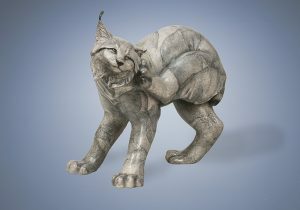 The granite like finish mimics the cat’s ghostlike qualities. The sculpture measures 10″ square and is a limited edition of 50. Inquire for dealer informtion. For two months of the year, I have the pleasure and privilege of observing these magnificent mountain grizzly bears as they fish on the Lardeau River. 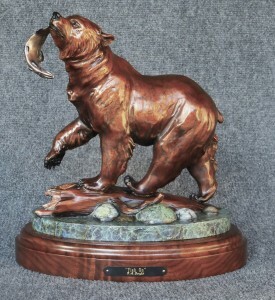 In this sculpture entitled “Fish On!” a cocky young griz has caught his first trout. Snagged only by the tail, this feisty fish writes his own ending to this story. As I have often seen, success is not always a given. 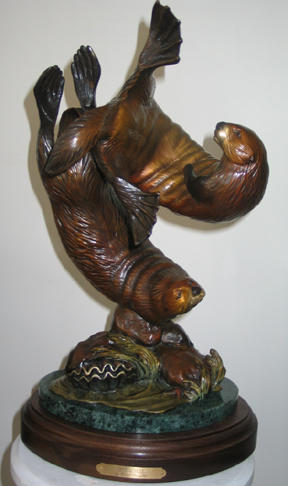 This sculpture measures 12″ tall and is mounted on walnut. Inquire to purchase. 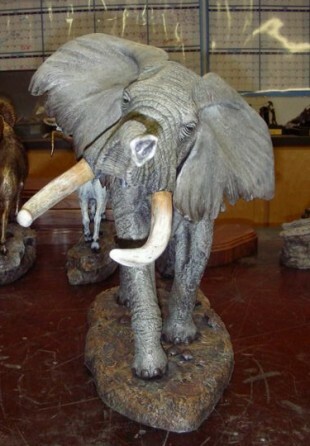 This a big bull African elephant! He hears you. He smells you. He might even see you. Get ready to run! 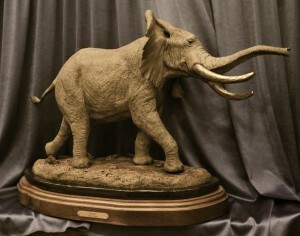 This tusker is ready to “Rumble.” This bronze stands 18 inches tall and measures 28″ long. This piece will be mounted on black marble atop a walnut base. “Rumble” is strictly limited to 25 castings and it is a very rare sculpture in that was jointly created by Rick and Carole to showcase their specific sculpture skills. 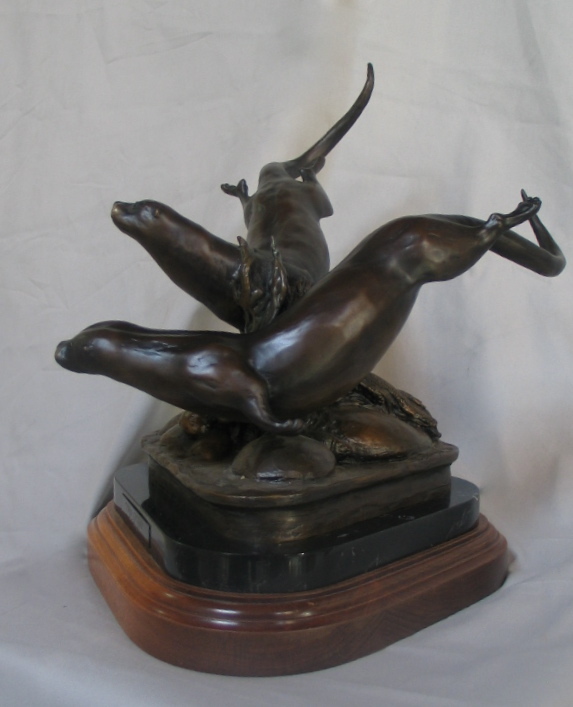 It is shown in enhanced color patina but can also be finished in the warm classic bronze tones. Inquire. “Baja” was inspired by the graceful rhythm of dolphins in and out of the water as they travel on the pressure way at the prow of the boat. This limited editition bronze has a verdigris patina and is mounted on black marble. Edition limited to 36. It is 14 inches long and 10 inches tall. Inquire for more details. 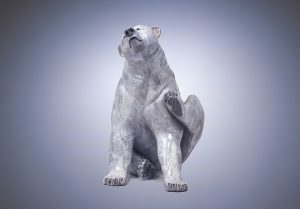 All the charm of “Otter Vase” but in lamp form. 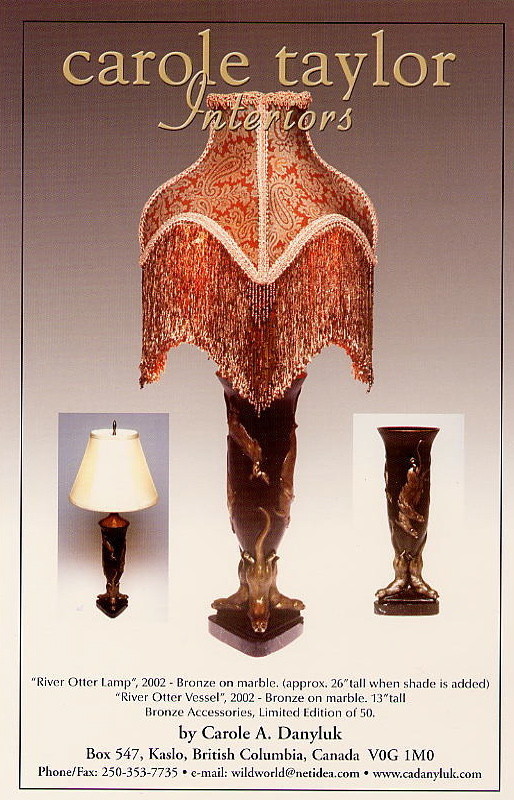 Includes silk shade as shown or cream colored silk shade. Including the shade, it is 24″ tall.$1500. includes delivery in US and Canada. Love them or not, wolves play a vital role in the natural world. One can only admire how they raise and teach their young, developing strong family ties and hierarchies. They are talented and efficient hunters and their very presence often points to a healthy ecosystem rich in prey animals. “Long Distance Calling” refers to the long ranges that wolves’ voices carry to communicate their concerns to rival packs. 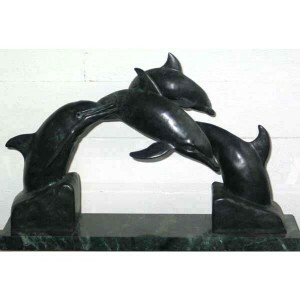 This limited edition bronze sculpture is mounted on grey and white marble and fine walnut wood. It stands 10″ tall. Edition limited to 50. Inquire for more information. After a particularly messy meal of shellfish and sea urchins, sea otters can be seen twirling and spinning in the water. This is believed to be their way of cleaning themselves up. 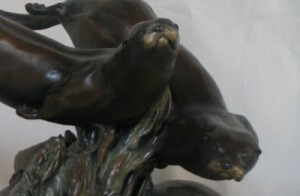 “Spin Cycle” is a pair of sea otters doing just that. The elegant forms of these animals rides above other sea creatures on the base such including a blue crab. This limited edition bronze sculpture stands 14″‘ tall and is a limited edition of 50. It is mounted on marble and fine walnut wood. Inquire for more details.